I was never an avid church-goer, but I did have a brief conversion when, for a few months, I was very interested in the daughter of the local Baptist minister. Fortunately for me, this high-school romance petered out long before I had to decide anything life changing, such as full body immersion baptism or renouncing dancing. My wife would probably tell you that I have indeed renounced dancing, but these days its for aesthetic reasons (I just don't look very cool when I dance - literally as well as figuratively! ), rather than for reasons of religion. My only other really religious undertaking was playing cricket as part of a Methodist Church cricket team (see - I would change denominations according to social or sporting rather than spiritual needs!). This year Queensland celebrates its 150th birthday, and this little church has been around for more than 140 of those years. 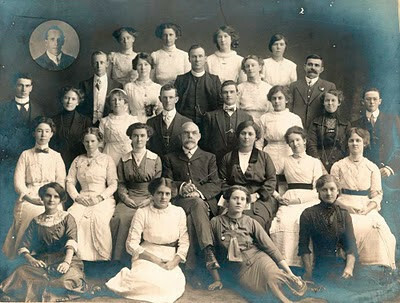 Here is a picture from 1914, showing the members of the church's choir. In those days it was the Brisbane Primitive Methodist Chapel, situated in Oxford St on land donated by local farmer, Mr Riding. Now we can see the church today, situated (in the same place) on the roundabout where Oxford St, Lytton Rd, Riding Rd and Hawthorne Rd converge. Rather a good place for a church, if you ask me - I pray every time I get to a roundabout! What is it with Brisbane engineers and those darned roundabouts, anyway? The church is now the Bulimba Uniting Church, and it has survived into the 21st century admirably. It even has its own web page, where it advises that it is very family-orientated. I wonder if it has a cricket team? Oops, it looks like you were taken in by the incorrect identification of the old photo in Picture Queensland. I believe it shows the former Bulimba Council Chambers and Hall, which used to stand near the church. They made a great pair -- two two-storey timber buildings of similar scale and form, both facing the five-ways intersection. (I have sent a message to the John Oxley Library, pointing out the mistake).